The Airbus A330-200 is the backbone of Etihad Airways fleet with 23 planes currently being in service. Until recently the A330 operated between Abu Dhabi and Beijing and would, after a short stop in China's capital continue towards Nagoya, Japan. 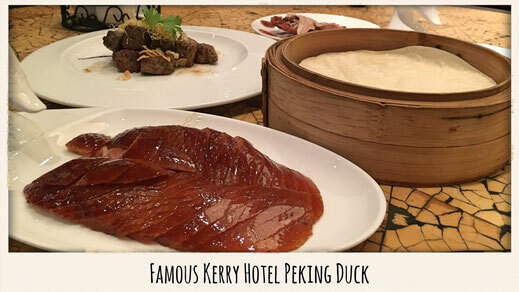 This time I kicked off my trip at the beautiful Kerry Centre Hotel in the heart of Beijing, featuring the biggest gym in the city and serves the best Beijing Duck, I can vouch for that. 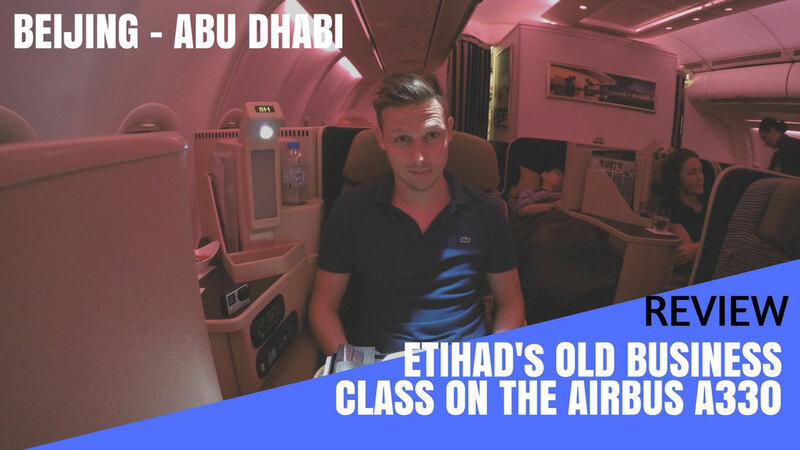 If you don't want to read the review (I know, too many words) you can just lean back and enjoy my video report which gives you a detailed inside of what it's like to travel on Etihad Airways Business Class. If Etihad Airways wanted to showcase any of it's Business Class seats they wouldn't probably pick the ones on their Airbuses. However, even though it is one of their older seats it's still an absolute premium product but also no comparison to the new seats on the Dreamliner or the Boeing 777. In the centre area, seats alternated between being more separated from one another and closer to the aisle, and being in a “honeymoon” configuration, the best choice if you travel with your partner or friend. The entire Business Class was squeezed in between the front part of the cabin which made it look a bit packed. The window seats are in a staggered configuration. My seat 8H, which wasn't a “real” window seat. A little less private then the ones that are directly located at the window. 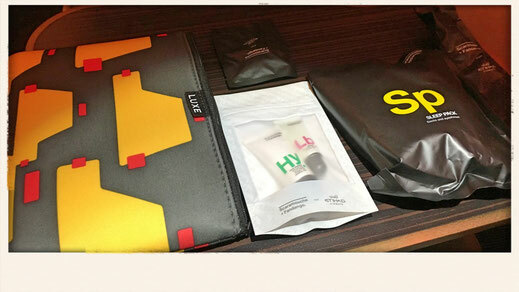 Great Sleeping Quality, Basic Amenity Kit and Alright Headphones. The seat is fairly comfortable and turns into a complete flat bed. 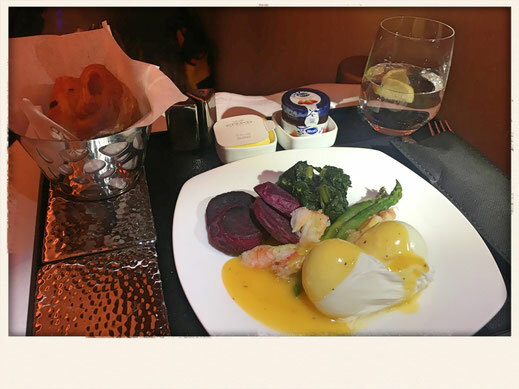 The sleeping quality was great and I didn't feel as exposed as flying on British Airways Business Class on their Airbus A380 were I was constantly bothered by crew and passengers walking past. Also the blankets and pillow were of a more decent quality. Overall I did get a great sleep on those seats. All the storage space is literally located on your right hand side. 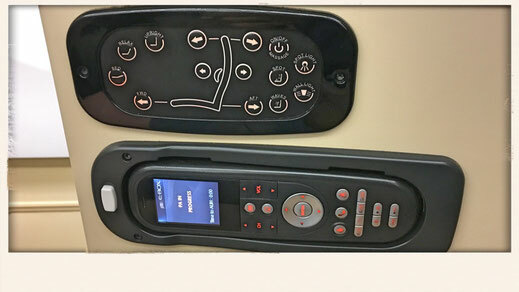 It has enough room for your phone, headsets or a book, however make sure you don't place anything there for take off or landing unless you want to see it fly through the cabin. There is also a seperate holder for a water bottle. They amenity kit is very basic. It comes with a toothbrush, socks and lip balm. No cologne or after shave as you can find it on Qatar Airways premium product. 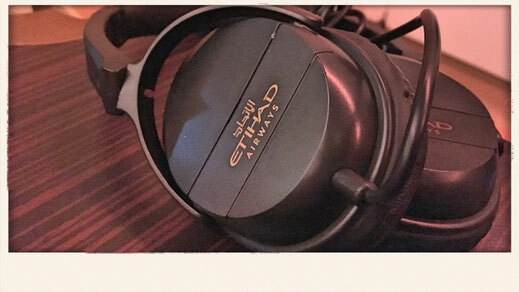 Also the headphones are rather average. 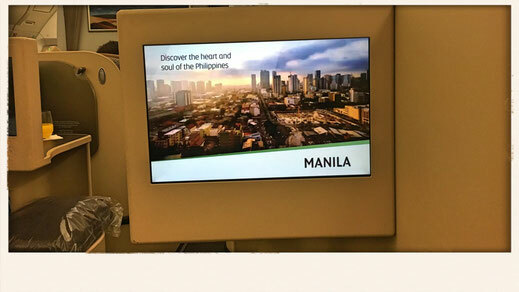 The sound quality wasn't too overwhelming for a 5-Star Airline. WiFi was also available for a small fee. The dinning experience on the flight was outstanding. First of all, you don't have any set dinner time. Which means you can eat whenever you feel like it. That is my favorite concept. Osama, the Food and Beverage Manager (Yes Etihad has these instead of Sky Chefs) was a great guy. He guided me through the wine list and gave me some great recommendations. I really enjoyed that. 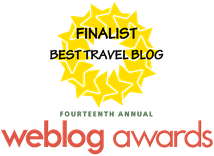 The service was professional and very efficient! Lovely Wine, Great Soup, Flavourful Dinner! The flight departs Beijing an hour past midnight and assuming that most people have had dinner before the board they only offer some light food options. 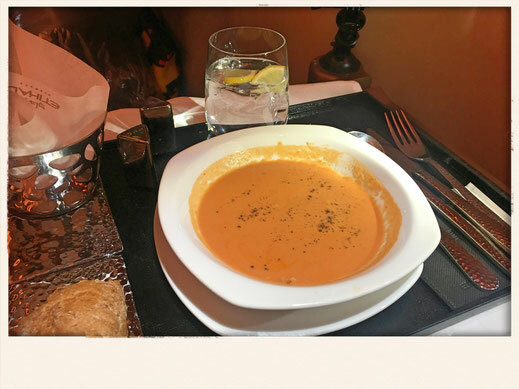 Osama pointed out the Tomato & Cumin soup which was outstanding. It was full of flavours and probably one of the best soups I have had. I had some lovely Chardonnay to go with it. A great starter! I haven't eaten anything so I was still hungry. I could choose between a Turkey Sandwich or Poached Eggs with asparagus, spinach, Alaskan Crab crawls and purple potatoes. As you can see below, I decided to go with the eggs. Once again, the ingredients were super fresh, the crab meat was delicious and I would give it a 9 out of 10. Best Latte you can get in the Skies! After a proper sleep, I was ready for breakfast. I would start with a Coffee Latte. 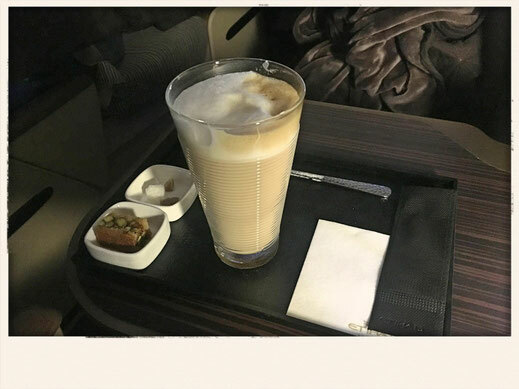 It is the best Latte you get on any airline and I really mean it! It's served in a tall glass and it actually tastes like one as well. 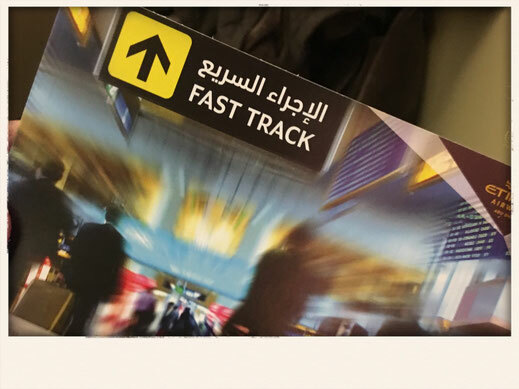 Etihad really pays attention to that detail and I really appreciate that. My breakfast of choice was the Vegetable Frittata. Which consist of chicken sausage, roast potatoes, sun blushed tomato, ratatouilie and steamed spinach. It came with a side of bread and croissants. Also strawberry jam and butter were surfed of course. Once again, it was just lovely and not too dry. 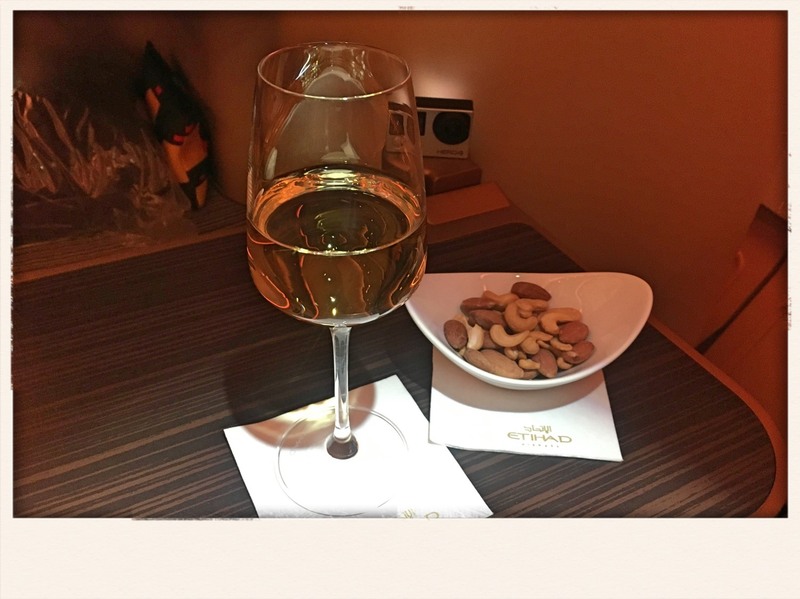 I really enjoyed the food experience and the quick service on this flight with Etihad. 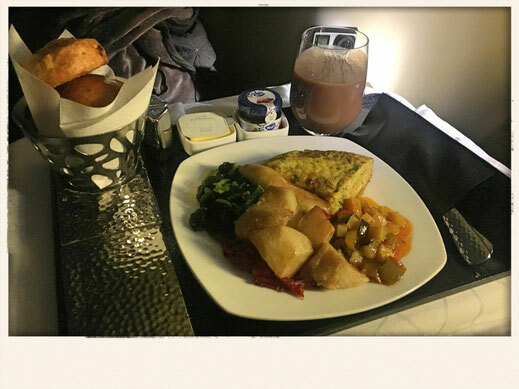 After breakfast, the crew would hand out fast track tickets to all business class travellers not having any connecting flights. However, Abu Dhabi immigration doesn't get as busy as Dubai for instance and very few people where arriving at this time of the day. When arriving at AUH you can make use of Etihad's exclusive limousine service or their arrival lounge, which I haven't had the chance to check out. 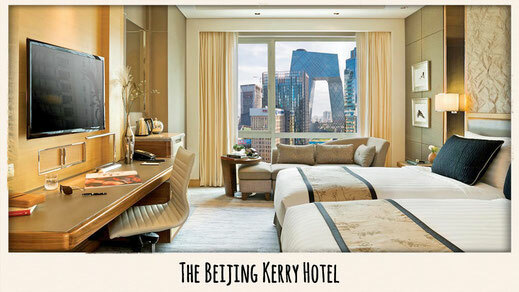 However, the arrival offers a help desk happy to help you with your further travelling plans. 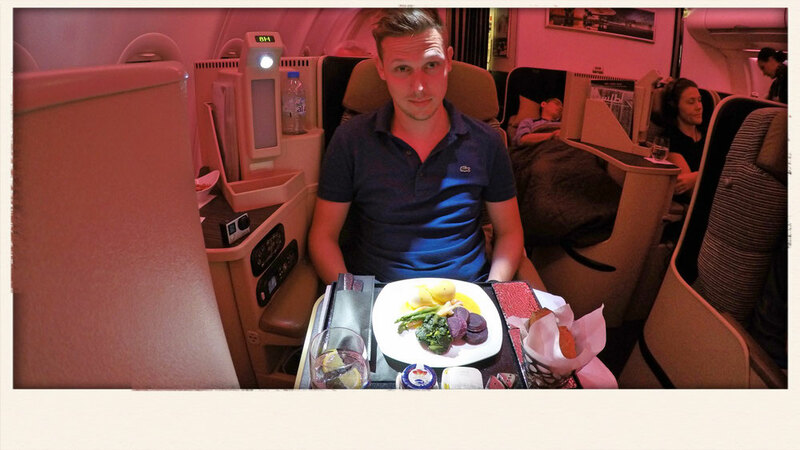 I spent most of the time sleeping and eating as you can probably see but the onboard entertainment was solid. You had a great variety of movies from all over the world. I watched Sicario, a thriller about a FBI task force tracking Mexican drug dealers. Great movie. Also a lot of Bollywood movies and a handful of Chinese films are available. 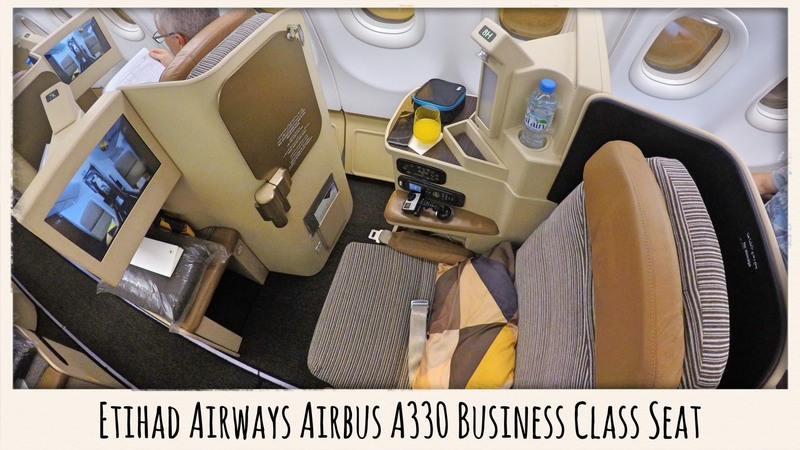 Etihad Airbus A330 cabins are still coming with the old Business Class seats. Which ain't too bad but no comparison to the new seats featured on the Airbus A380 or the 787 Dreamliner. However I'd still give it a 7 out of 10. The service was solid and the F&B Manger Osama was on top of the game, those guys are great! The food was definitely a highlight on this flight. It's fresh, delicious and the whole dine on demand concept is a huge plus. If you don't mind the older seats, you'll certainly have a great time!